We love how sophisticated Liu Wen’s simple look is! Her jet-black hair emitting..
We love how sophisticated Liu Wen’s simple look is! Her jet-black hair emitting a sheen that makes it extra gorgeous! If you have fine hair, ask your hairstylist to cut the ends blunt just like this one. Doing so adds bulk and volume to fine, limp strands. Get that cool preppy look by doing an unkempt high bun and adding a slim headband..
Liu Wen mirrors Bettie Page’s infamous pin up girl curly hairstyle with mid-fore..
Liu Wen mirrors Bettie Page’s infamous pin up girl curly hairstyle with mid-forehead cut bangs. How-to: apply mousse all over damp hair then allow hair to air-dry. Once dried, divide hair into 1” sections. Roll each section and clip them flat against your head using small aluminum duck bill clips. Remove clips after 45 minutes to an hour then brush the curls gently. Use a thin round brush when you blow dry your bangs. Curl the lower part of your bangs towards your forehead. Hold the style with some hairspray. Get your modern chic on with Liu Wen’s stylishly botched updo with soft, thin te..
Get your modern chic on with Liu Wen’s stylishly botched updo with soft, thin tendrils on one side! The side-swept bangs are kept sleek and straight while the rest is in disarray. This is a good hairstyle to try when attending a party or a fun night out on the town with friends. 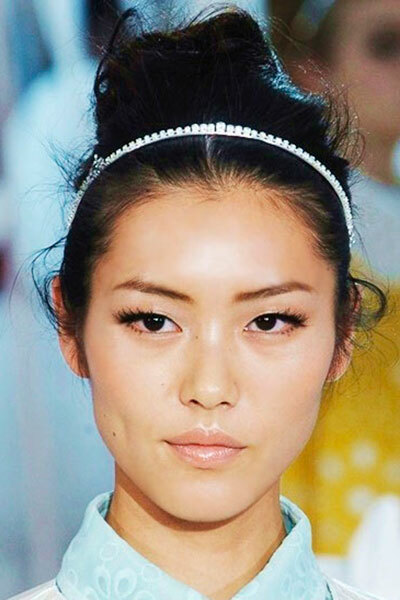 Dubbed as China’s first supermodel, Liu Wen is sporting an elegant low chignon.. Dubbed as China’s first supermodel, Liu Wen is sporting an elegant low chignon hairstyle at the 65th Annual Cannes Film Festival. DIY: Part your hair to one side after brushing it thoroughly. Create two sections: section 1 – about 6” thick from the front of the hair until right behind the right ear. The rest of the hair is section 2. Pin section one first to get it out of the way. Gather section 2 loosely into a low ponytail and secure with elastic. Twist the ends into a big knot and secure with pins. Unclip section 1, smoothen it out then wrap it around the knot and put pins to hold it. Spritz hairspray all over to set the coif.